A slow start and lack of scoring was not what the New Jersey Devils had in mind when entering the 2015-16 campaign. While these Devils are younger, faster and supportive, the attacking portion with regard to finishing at the net, remained a concern. Yet it could be changing. One moment and one game makes not a season but one important Devil appears as though he’s taking the attacking mantra to heart. 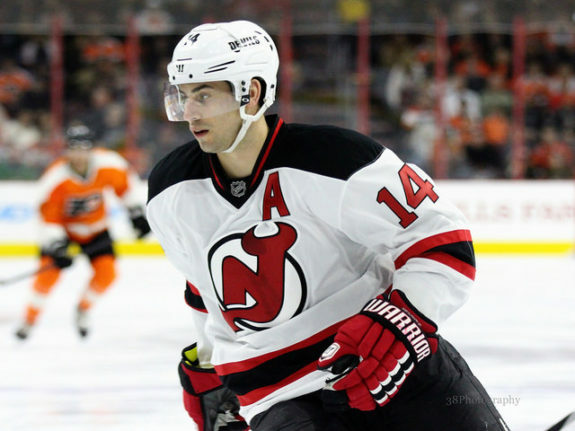 Enter one Adam Henrique. Everyone knows about Rico’s penchant for being clutch, since his rookie season. Two seasons ago it looked as though Henrique was going to make a huge jump, coming off a 25-goal campaign. While he equaled his point total last season (43), the scoring quotient dropped to 16 tallies. In the early going this season, Henrique is much more aggressive around the net and the results are starting to show. Henrique has registered goals in three of the past four contests and has factored into scoring late. With the Devils trailing the San Jose Sharks and the impenetrable Martin Jones in the third period, 1-0, Henrique parked in front of the net and cashed in, tipping home an equalizer from a Damon Severson shot on the power play. Henrique would also net a shootout goal in the 2-1 losing effort. Although it was a tough loss, New Jersey proved its resolve and ability to grind and play with grit. The carryover was evident as the Devils crossed the Hudson River to take on the rival New York Rangers. With the Devils down 1-0 early in the second frame, Henrique followed his own shot, charged the net and pounded home the rebound, past Henrik Lundqvist for the equalizer. In overtime, Henrique led the rush, hitting Lee Stempniak on the 2-1 winner. Perhaps Henrique will follow in the footsteps of another clutch former Devil, John MacLean. From his third to his fourth season, MacLean’s goal and point totals went from 31 and 67 to 23 and 39. Yet, in his fifth season, MacLean’s goal ledger jumped to 42, the first of three straight 40-plus goal campaigns. Could the same hold true for Henrique’s career trajectory? Thus far, Henrique leads the Devils with three markers, is tied with a club best four points, one power play tally and also tops the team with 16 shots on goal. Henrique’s minutes are on the upswing as well, averaging a career high 19:27. His shooting percentage is also at a career best of 18.8%. Additionally, Henrique’s relative corsi for percentage at even strength (7.1) and his relative fenwick for (10.9) are at career best levels. Obviously we’re going on a short sample size here but it merits noting how Henrique is being counted on as a young but veteran leader. Bryce Salvador is retired, Jaromir Jagr is showcasing his talents in the Sunshine State and Patrik Elias remains on the mend. Therefore, as the old saying goes, necessity is the mother of invention. Adam Henrique (Amy Irvin / The Hockey Writers). Not that leaders are simply invented but the Devils’ alternate captain is taking to his new role and displaying an aggressive, relentless style of play.